Though the UCMP collections are mainly focused on the fossil relics of Earth's deep history, the institution also houses many "specimens" from the recent past. Because the collections date back to 1869 and beyond, they include many documents relevant to the history of California and of paleontological research  dig photographs, field notes, and a wide variety of material revealing fascinating connections between the process of science and its social and cultural milieu. However, this archival material had never been formally cataloged and was left in further disarray after the move from McCone Hall to the Valley Life Sciences Building in 1995. The Cataloging Hidden Special Collections and Archives grant from the Andrew W. Mellon Foundation aimed to change that. Now, after three years of grant support, more than 80% of the archival material has been cataloged and is ready to reach a broader audience. One of the primary goals of the grant was to create online finding aids to allow researchers and other interested parties to easily search for and locate any of the thousands of items housed in the UCMP archives. This historical treasure trove includes detailed field notes, annotated papers and maps, original drawings, scientific illustrations, newspaper clippings, collections ledgers, photographic documentation of specimens and field sites (16 mm film, lantern slides, glass negatives, 35 mm slides, and prints), professional and personal correspondence, research notes, administrative documents, manuscripts, and more. Check it out for yourself. The project was eye-opening to UCMP workers because no one realized quite how many historical records had been squirreled away over the years, and they number in the thousands. For anyone interested in University of California history, digging into the archives was an exciting experience. You never knew what you were going to find next! In the museum's specimen database, more than 71,000 links were added that connect our specimen database to our archival database. For example, a researcher searching the specimen database for a specific UCMP fossil can use these aids to learn where field notes or other information pertaining to that specimen exist in the UCMP archives. Dave Strauss, our volunteer photographer, photographed all of paleobotanist Ralph W. Chaney's hundreds of lantern slides and glass negatives. These can now be viewed on CalPhotos. From the "Type of Photo" menu, select "Landscape--Habitat" (the majority of the Chaney images can be found in this category); in the "Collection" menu, select "UCMP;" and then click "Search." Dave is currently preparing to photograph select examples from the Samuel P. Welles collection of an estimated 6,000 negatives. These too will be added to CalPhotos. For particularly important or interesting topics, the museum has elected to provide even more detailed online descriptions than usual. For example, for the correspondence of vertebrate paleontologist Ruben A. Stirton  rather than give a simple list of correspondents, there is a short description of every document. In addition, many of the field notes descriptions will be expanded in the future. An assortment of items from the UCMP archives that all relate to the Black Hawk Ranch Quarry in Danville, CA. 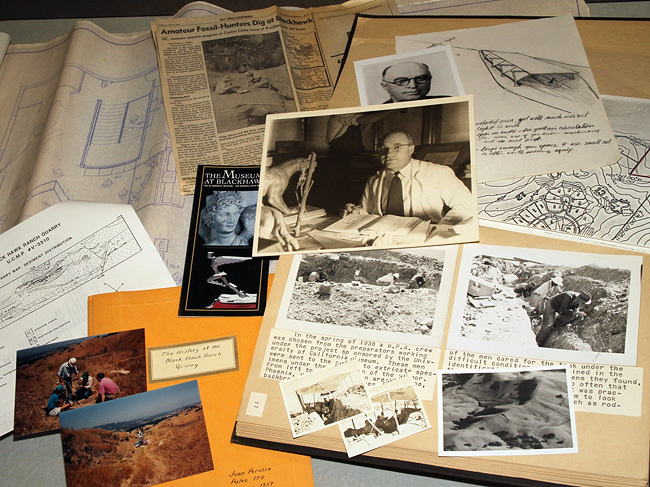 The items include photos from the earliest excavations in the late 1930s; two pages from King Arthur Richey's scrapbook chronicling the excavation of the quarry from 1937 to 1940; quarry photos from the 1970s and 1980s; a portrait of quarry discoverer Bruce Clark; a photo of Ruben Stirton, who began the first serious excavations at Black Hawk in 1937; a July 1992 newspaper article about opportunities for the public to work at the quarry; a sketch of a proposed shelter for the quarry; a topographic map showing the plot of University land on which the quarry is located; a cross-sectional sediment distribution map of the quarry made by Ted Daeschler for his Masters thesis; a student paper on the history of the quarry; an exhibits brochure from the Museums at Blackhawk dating from the early 1990s; and the blueprints of the paleontology wing at the Museums at Blackhawk. Though we've made significant progress in improving the accessibility and searchability of our archives, there is much left to do. Future work on the archive project will rely on URAP students and volunteers, and will aim to complete the online finding aids as well as to organize and consolidate all the cataloged material in designated storage areas. 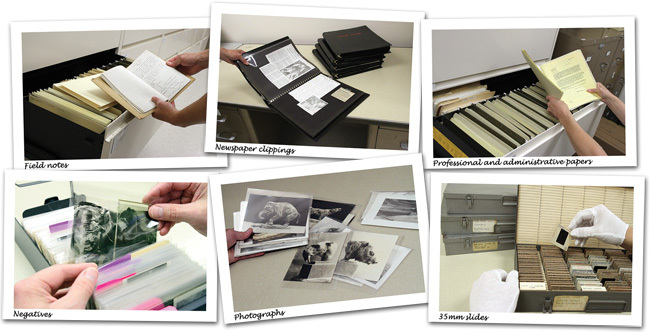 This project marks yet another new chapter in the storied UCMP history and one that bridges invaluable written and photographic material with our fossil collections providing a richer context of the UCMP for our users. To learn more about the archiving grant, check out these links.